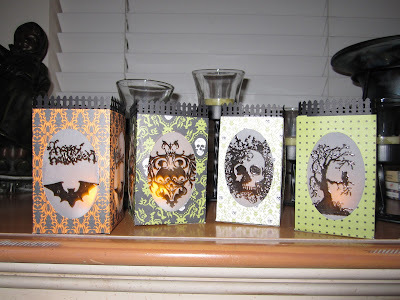 The paper is last year's Cast A Spell, and the dotted DSP is from this years Wicked Fun. The stamps are from House of Haunts and From the Crypt. 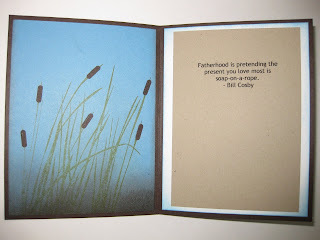 I used SU Vellum and heat embossed the images with versamark, black ink and black embossing powder. 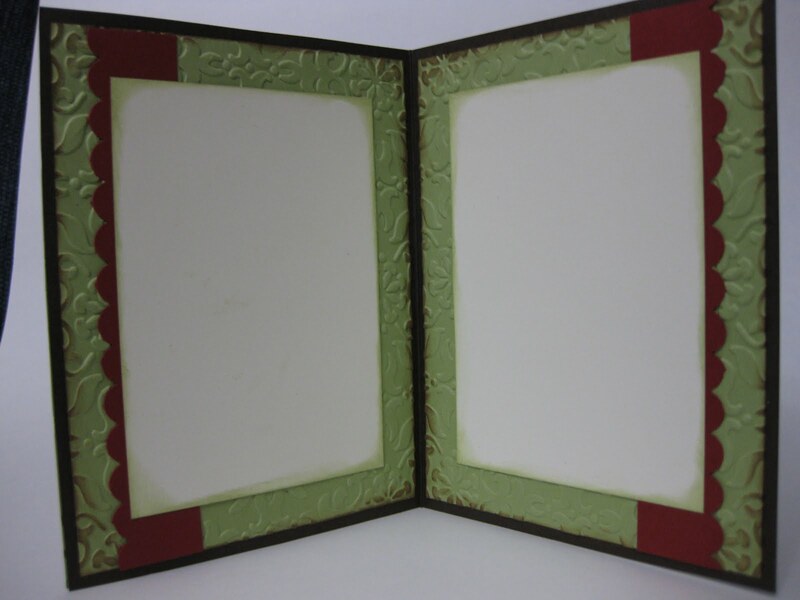 Vellum creates incredible embossed images! I'm going to line my walkway with these on Halloween night. For now, they will sit in my window sill at night so they can be seen from the street. I hope they inspire you to have a BOO-tiful Halloween! Hi Everyone! I've really missed posting on my blog! The good news is that yes, my insurance will pay for a new camera! Bad news is I haven't replaced it yet and I won't get a check from the insurance company for another few weeks. I wanted to post something, and I did find this picture of a card I made a few weeks ago but never posted. 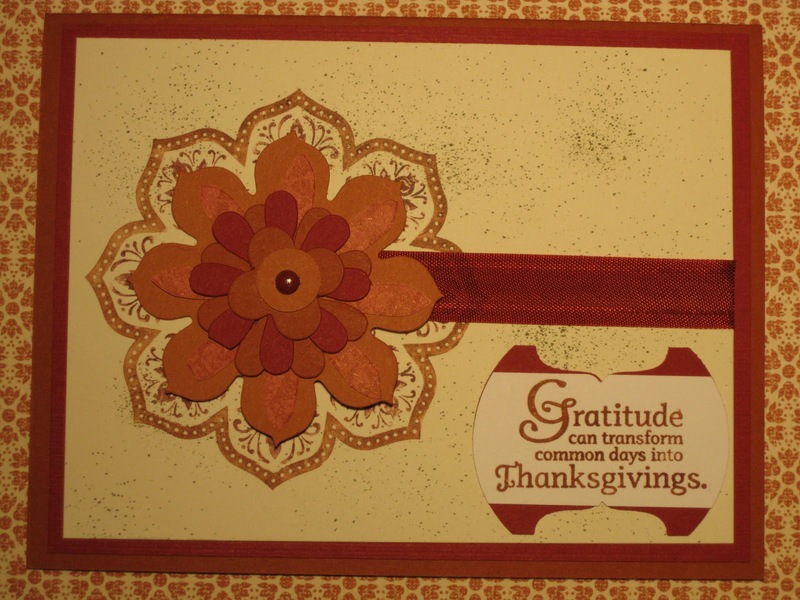 The dsp is from the new Autumn Spice collection on page 13 of the Holiday Mini. I love this paper and the coordinating stamp, Day of Gratitude! I've used Cajun Craze, Cherry Cobbler and some Peach Parfait for cardstock and ink here. I used the extra large round tab punch for the label. The sentiment was stamped on a 1 inch strip of paper, then punch with the same punch and overlayed onto my mat label. 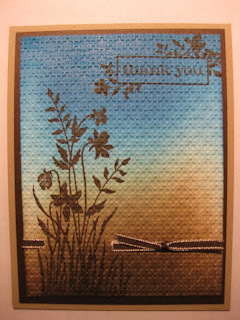 I used my Blossom Party die to cut the flowers that are overlayed on the large stamp from Days of Gratitude. I used the color spritzre tool and my Early Espresso marker to spritz some color to my cardface. This was a fairly quick card and I'm looking forward to making some more! Thanks for looking! I'm sad to report that my wonderful camera of which i used to take pictures of my crafts and cards was stolen on Wednesday. I know, what a bummer, right?! I'm still being crafty, however, there will be a lull in my postings of original creations until I can replace my camera. Hopefully, my insurance will cover it and I can purchase another next week! Here's hoping for awesome insurance coverage! All in a pretty Box! The brayered cards I've been posting are to be given away in a silent auction to raise money for a non-profit organization called Bikes for Kids Utah. I got the boxes from Zurchers and had a ball dressin' 'em up! 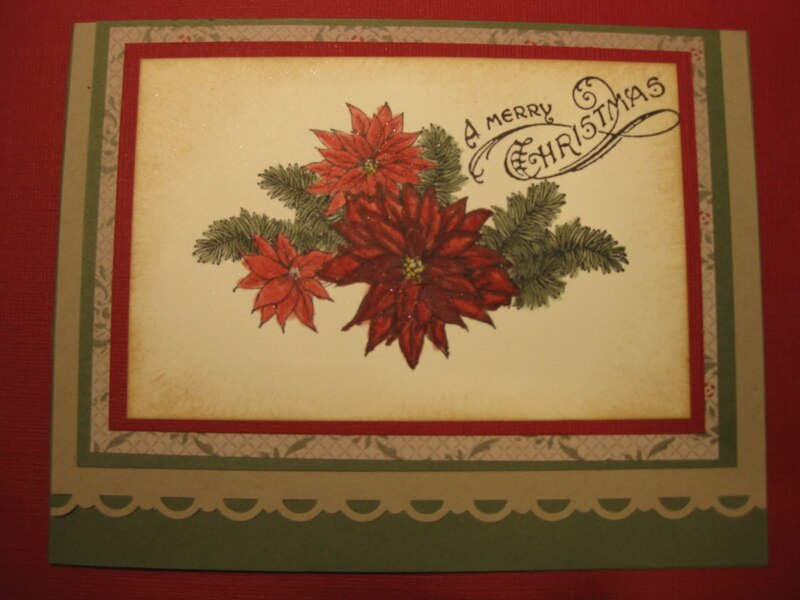 Sincere Salutations and Fast and Fabulous were used, and each set uses 3 colors from each color family I saw this card made by Jennifer Weide on SC and thought it was perfect for a set of cards. This box was first sprayed with light blue glitter spray while it was still flat and unfolded. I covered the blue section, and then sprayed green glitter spray to make the ground or grass. I heat embossed the tree trunk with Creamy Caramel, then proceeded to heat emboss the leaves in Garden Green, Barely Banana, Cajun Craze, Old Olive and Really Rust. This was simple and fun but a bit time consuming! The cards that go inside of it are from my last post! Thanks for looking! Here's some more brayering, once again inspired by Michelle Zindorf. Michelle posted the "Fall" card, and I ran with it, creating a similar card for each season. I made 5 of each, 1 for me to keep, and two sets of two cards each to be given away as gifts. These are blank cards, but they are layered and finished on the inside as well. Season of Friendship and Style Beautiful are the stamp sets used. 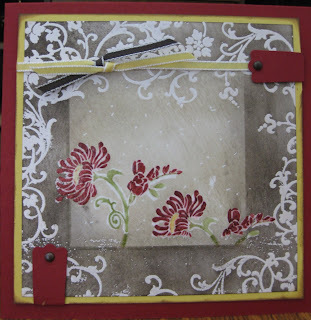 The important technique here is emboss resist, which is what is done first, with the except of the Winter card. Michelle describes how to use Versamark and ink stamped together, then heated as your first step, then brayer the sky, then sponge your grass, then stamp the tree, sponge the 'ground' and add white gel pen highlights. The winter card is done differently. First, tear through the sticky part of a post it note to make your hilly horizon. Then brayer your sky, then sponge low grey clouds, then sponge your horizon. remove the post it note. Lightly sponge Going Grey at the bottom tip, then a little Basic Grey. Stamp your tree. Using Whisper White Craft Ink, stamp your snowflakes, then heat emboss with Iridescent Ice. Add your white gel highlights, making snow in the branch crevices. Dust a bit more Going Grey around the tree for your shadow and mount to your mats. Fall: Cajun Craze, More Mustard, Wild Wasabi, Marina Mist and Not Quite Navy. 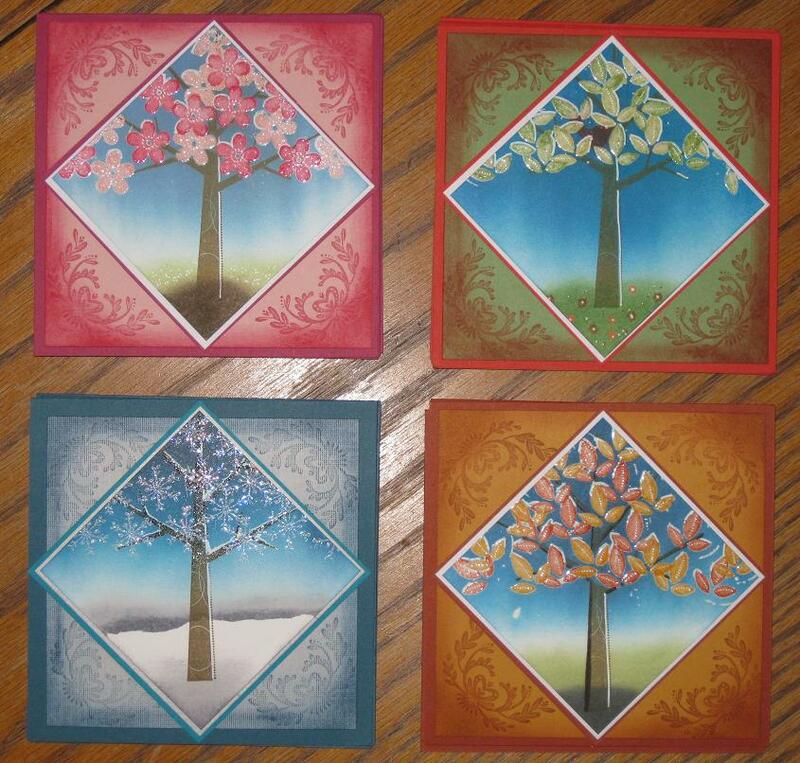 These are 5 x 5 cards finished. The mat stamped with Style Beautiful is 4 1/2 square. The Square image on Whisper White is 3 1/4 square, with mats measuring 3 3/8 square and 3 1/2 square. These were really fun to make! I'm off to make a brayered gift box for them............have fun! 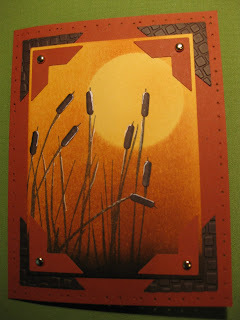 Many Thanks to Michelle Zindorf for her beautiful layout for the cattail card that is part of this set. Kudos to jadoherty on Splitcoast too! I made this set for my friend, Annie. I love brayering because the results are so pretty and it really doesn't take all that long! 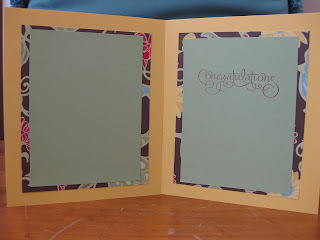 This last one was run through the lattice embossing folder after it was brayered and stamped. I saw this same card on SC and SCS and had to try it! 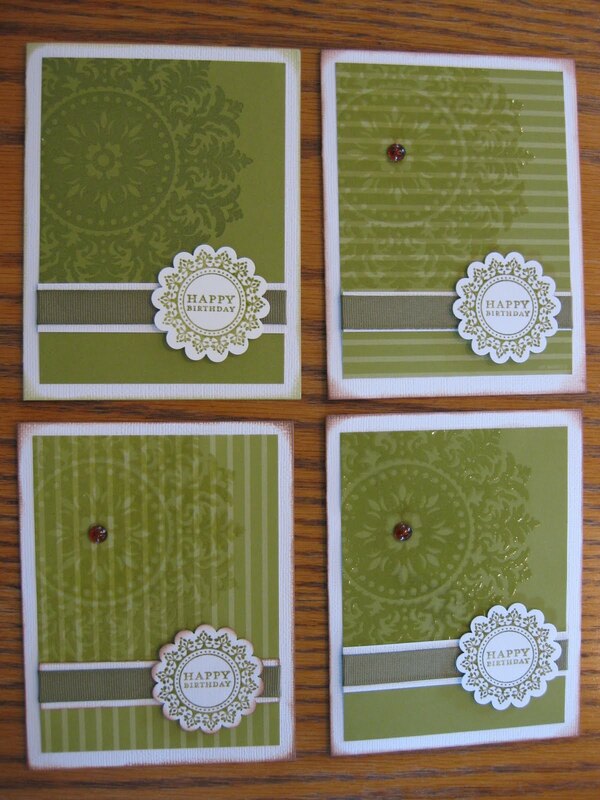 Lots of different stamp sets used for these three cards: Just Believe, Inspired By Nature and Watercolor Trio. 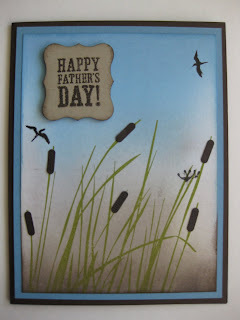 Several punches were used too: Photo Corner, oval, scallop, and the slot punch (cattails). 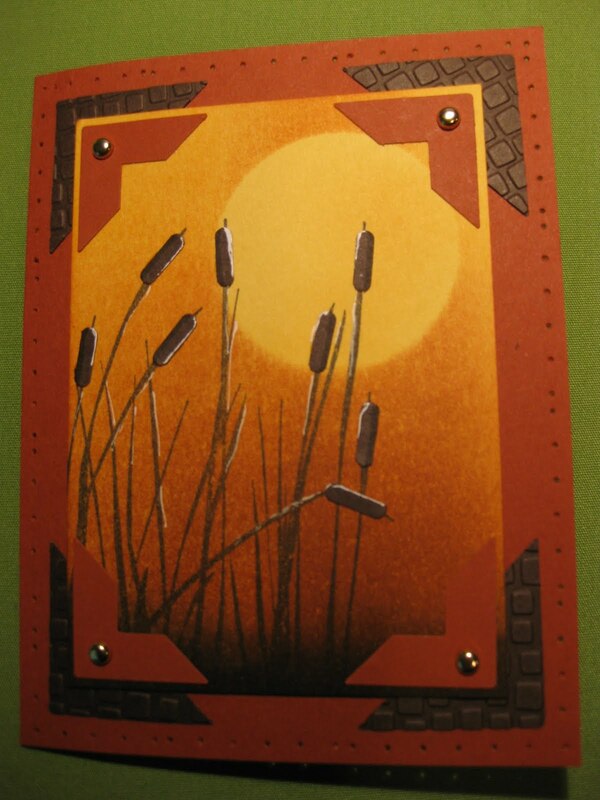 The cattail card was brayered on to Daffodil Delight, and the photo corners were run through an embossing folder. Next I'm going to make a brayered gift box to put them in! If you want to learn more about brayering, I highly recommend Michelle Zindorf's website, tutorials and classes. Google her and find over 300 tutorials for her beautiful work! Thanks for looking and I wish you a fun and stampy weekend! The holiday mini has lots of fun surprises, and this set is great because it covers several holidays. I hadn't played with the hearts in the set, but as soon as I saw it I thought of the Raspberry Tart dp with it's paisley background. 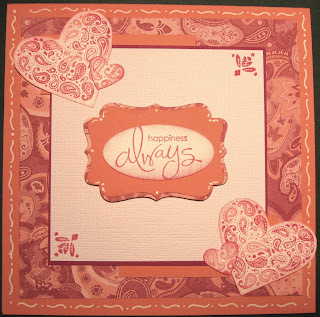 I used the 'rock and roll' technique by first loading the heart stamps with Cameo Coral, then lightly tapping and rocking the edges of the stamp in Rose Red. It creates a pretty variegated fad and I like the result! I don't have the large heart punch so I cut those by hand, and I used the bitty punch set for the small hearts and inked the edges with Rose Red The extra large punch (pg. 25 of the holiday mini) is my new favorite tag punch! To make the mat behind it, simply punch your tag, then cut an X corner to corned and adhere them to your solid tag. Cool, eh? Two fun tips today - matting a punch and rock and roll! 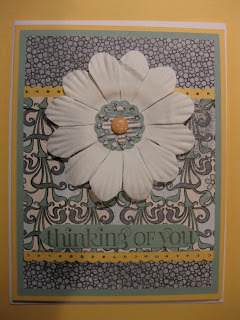 The small corner detail stamp is from Style Beautiful and the sentiment is from Whimsical Words. This is a quick card that looks great with some dimensionals to make the cut outs pop, and some doodling with a white gel pen for a bit more framing and focus. There's more to come - I've been busy! :) Thanks so much for looking and feel free to add a comment, suggestion or follow me and let me know your blog address so I can follow YOUR creations. I love this dsp, although I didn't at first. Now, I'm sad it's no longer available. Anywho, I'm loving this Curly Cute with the larger, playful sentiment. It's very cheery and I'm looking forward to using all the sentiments in the set! These cards came together very quickly and are very simple. It's the dsp that dresses them up! For Thinking of You, I mixed two printed dp's and accented the edges with the ribbon border punch in Apricot Appeal. 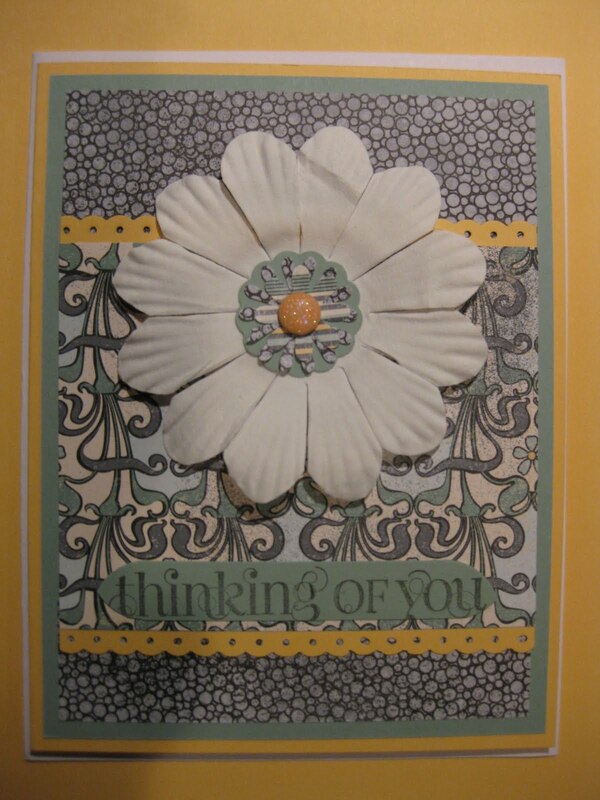 The sentiment was stamped in Basic Grey, and I used a corner rounder for the long, oval shape. 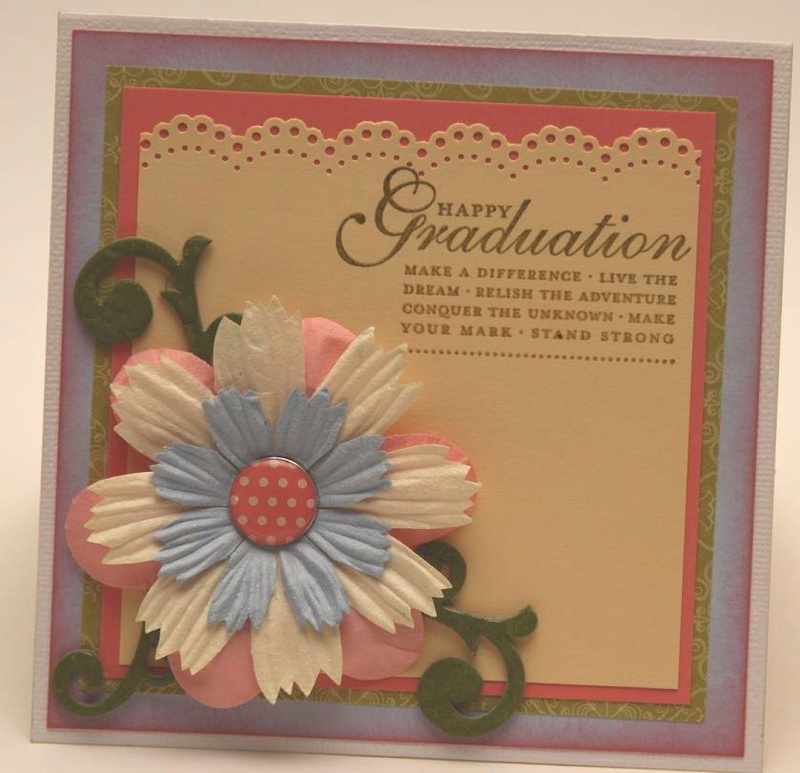 I used a small scallop punch to add some color to the center of the flower along with a brad. Had I wanted to take more time, I would have used some Apricot Appeal reinker on the Pretties Flower. I hope someone will case this and do that - I'd love to see it! The Thank You card uses four punches and a quick ribbon treatment. 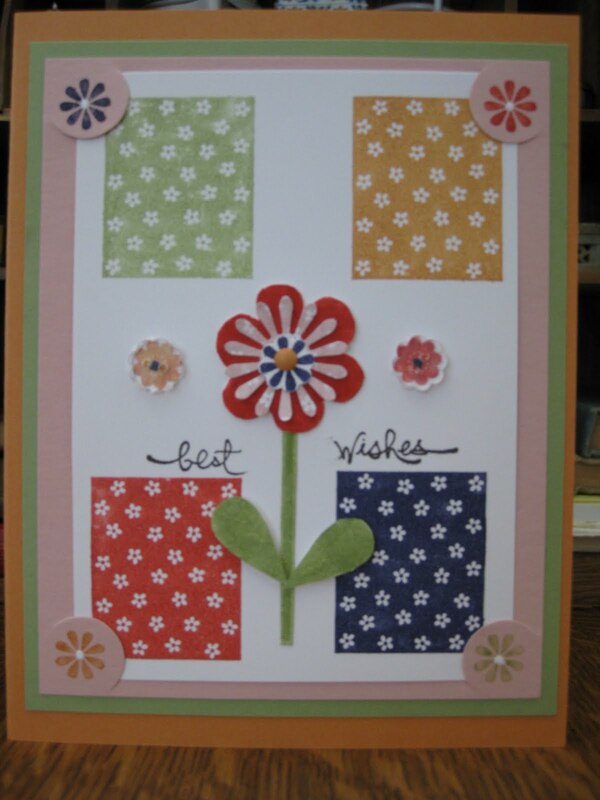 I used the large flower, and large, medium and small scallop punches. The medium scallop punch was then cut at each scallop towards the center to create petals. Easy! Thanks for checking out these quick cards. I've been working on a set of brayered cards for a friend. Can't wait to finish them and show them to you! Make it a great week, and thanks for stopping by and following me. I love your comments and visiting your blogs, too! Here's a simple card that's very fun to color! The dp is from Deck the Halls and the layers are Very Vanilla, Cherry Cobbler, Crumb Cake (Scallop Trim Border Punch) and Always Artichoke. I prefer blender pens to the aqua painter. The image is also from the Holiday Mini and it's called Bells and Boughs. I stamped the image with Black Stazon first, then used my classic ink pads and blender pen to color the images. Cherry Cobbler was used for the flowers, Always Artichoke for the boughs, and Daffodil Delight for the flower centers. Black Stazon was used for the sentiment image. To brighten up the flowers I used some white glitter chalk which also softens the edges. I sponged some Creamy Caramel around the image mat to give it an aged vintage look. Coloring can sometimes be time consuming so this quick layout is a great way to balance out your time and still have a pretty card that looks like it took hours. Enjoy! 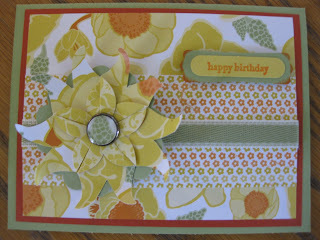 My card for today is a direct case from Merry Socha on stampinconnection.com. I thought the owl punch would work for a cute little penguin, and Merry had the same 'vision.' :) She made it easy for me! I think they are so darn cute! lol I used all Stampin' Up! products except for the scrap of blue background, the rubon sentiment, and the party hat which was made with my cricut. The ribbon has been available on the clearance rack at Stampin' Up - just click the Shop 24/7 button to the right to check out the sales! 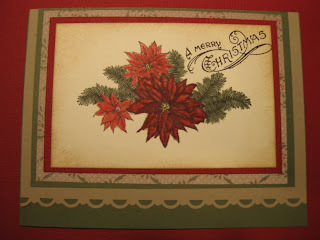 Tomorrow I'll post a card made from products in the new Holiday Mini catalog that was mailed to many of you! Make it a great day! Owl-y Flowers - love it! Well, I'm excited to say that I have a card to post every day this week! I was busy this weekend, as card making never feels like 'laboring' for me. It was a perfect time to enjoy myself by making cards for my sweet daughter and to get started on Christmas Cards. I know... Christmas, in September? I make ALOT of Christmas cards, as you will see in the coming months! Each 'petal' is created by cutting a 'v' between the owl ears. Then cut off the feet (sorry, that sounds so cruel - lol). Fold the owl lengthwise and pinch the bottom. This gives you a point from which to fold, and also brings the petals tips up a bit. From your bottom crease, fold each edge in until they touch. 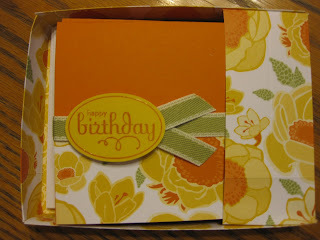 I then glued these to the large scallop punch of pear pizzaz cardstock. The center is a 1/2" punch of Garden Gala dp adhered to a build-a-brad. 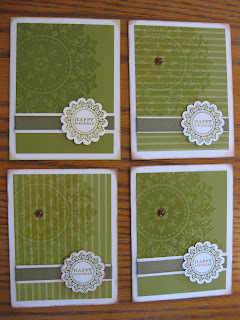 I had fun mixing the Garden Gala and Razzleberry Lemonade (retired) design papers, too! My daughter described this card as "cheerful." I'd have to agree! 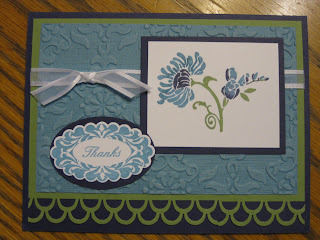 I have another example of owl flowers tomorrow using the Noveau Chic paper and one of the new stamp sets. Hope you'll stop by! Until then, make it a Stampin' Day! It's been over 3 weeks since my last post - yikes! Forgive me, friends. Life has been super busy, as I'm sure it has been for you, too. I left for vacation 2 days after my last post, came home, and have been busy getting my youngest child off to college. It's official, I'm an empty nester! Well, at least until she comes home for summer. Here's a cute photo of my girls from our vacation. We stayed on my Aunt's farm in Oregon. The girls got a kick out of my 81 year old Aunt's 'gater.' My Auntie drives it all over her farm - too cute! 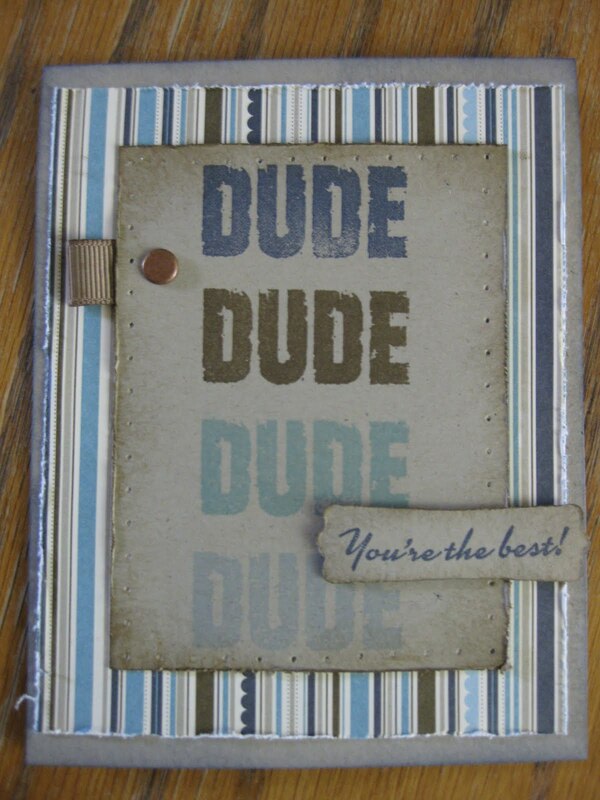 This uses the Friends Never Fade and Perfect Punches stamp sets. Colors are Wild Wasabi, Marina Mist and Concord Crush. So pretty together, don't you think? A little organza ribbon, the Vintage Wallpaper embossing folder, Large oval and large oval scallop punches, and a Martha Stewart border punch (any of the SU border punches would work, too) makes the recipe for this card. Again, this is pretty much a direct case. Search Friends Never Fade at SC, and you'll find others that are similar to this one. 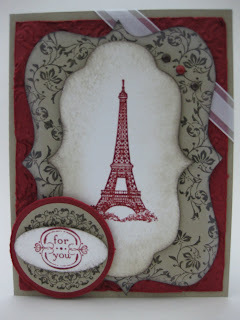 The Elegant Soiree DP and Crumb Cake paper were distressed, pierced and punched for this card. I really like the Bashful Blue, Baja Breeze, Soft Suede and Not Quite Navy color combo! The little ribbon loop is the reverse side of the Soft Suede polka dot ribbon. If you don't have a distressing tool, you can simply use your fingernail on the paper's edge for a similar effect. I'm on a card makin' mission during the month of September, and I'll be using lots of new goodies from the new Holiday Mini. Your copy, if you are on my mailing list, is being sent to you this week so keep a look out in your mail. It's one of the best occasion mini's I've seen with lots of new products! Oh, I LOVE new paper! Paper is my inspiration. How 'bout you? When I saw the new designer paper in the new Stampin' Up! catalog Iabout fell over - I wanted it ALL! lol I did purchase Woodland Walk and Blueberry Crisp (and a few others, I have to admit). And, as is true for many of you... I have boxes of pictures that are waiting for me to find the perfect time to put them into a scrapbook. Alas, I am not a very dedicated scrapbooker! However, I really love my youngest daughter's graduation pictures, so I committed to making two pages last night, and thought it a perfect opportunity to play with my new paper! First, I punched a scallop circle out of a different print of dsp than the one I chose to use for the rest of the flower. Then I punched 4 'owl bodies' from the new Owl Punch - yeah, really! I cut off the owl feet. I then folded each owl in half lengthwise. That crease is your guide to cut to the center from each of the owl's ears. It should look like a tulip when you are done with this step. Then from the bottom, fold each of the two edges from the center crease point. Punch a 1" to 1-1/2" circle to adhere to the back of your 'owl tulips'. Arrange them first so you know where to adhere them to the circle. Then adhere the circle to the scallop punch that you set aside. Use a paper piercer in the center of the flower to insert the brad. The brad was made with Stampin' Ups Brad Builder. Punch a 1/2" circle from the dsp you want to use. The clear plastic cover already has adhesive on it so stick your circle to the back of it. Then get a 1/2" glue dot, and put it on the brad base. Then adhere the paper/disc to the brad base, paper side down. Insert the brad and then use your fingernail or small scissors to lightly curl the flower tips upward. You're done! The flower was popped up on dimensionals, of course! You can make these with 4 to 6 owl/tulips, depending on how deeply you fold up the outside edges of the owl/tulips. The more narrow they are after folding, the more will fit in the circle. These flowers are VERY fun to make and look awesome. Add more dimension to them by inking the edges before the flower is assembled. Well, I'm off to run my weekend errands. Feel free to email me or comment, especially if you have questions about these pages, Stampin' Up products, or anything in general! I'm holding an open house! Each set has 3 Birthday Cards and 3 Thank You cards contained in this cute little box! I have several of these made using all different design paper. This one uses the new Garden Gala DSP, Pumpkin Pie cardstock and ink, daffodil delight cardstock and the new pear pizzaz poly ribbon. I heat embossed the sentiment with versamark and clear embossing powder, punched it with our large oval punch and popped it upon dimensionals. Super easy, demonstrable and very cheery, don't you think? I will also be displaying the wonderful card swaps I received at Convention. It's wonderful to receive card swaps that use stamps that I don't have so I can display a wider variety of products. I love that! I'm off to prepare for this event. Hope to see you there, and let me know if you saw this post and I will give away a free card! Do you know how much I love the Heat Embossing Technique? 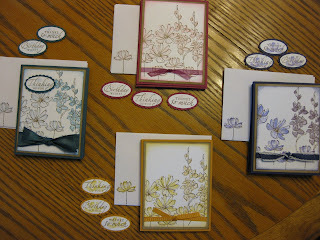 As soon as I saw the Silhouette Sentiments hostess set, I knew I wanted it! You can get this set FREE when you host a Stampin' Up stamp camp or party. 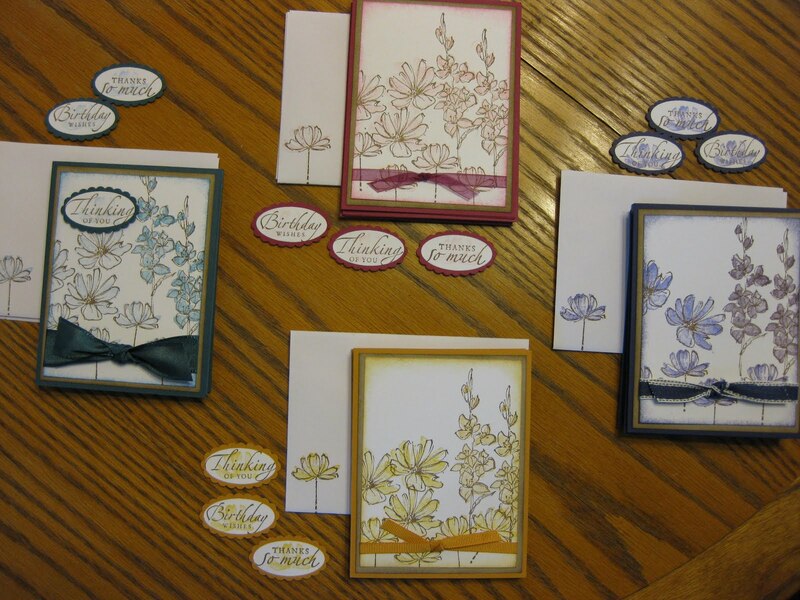 Leave me a comment if you would like to host a card making class. 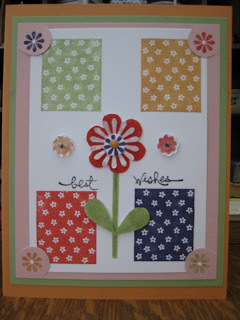 I would LOVE to teach you and your friends how to make cards just like this - it's easier than it looks! 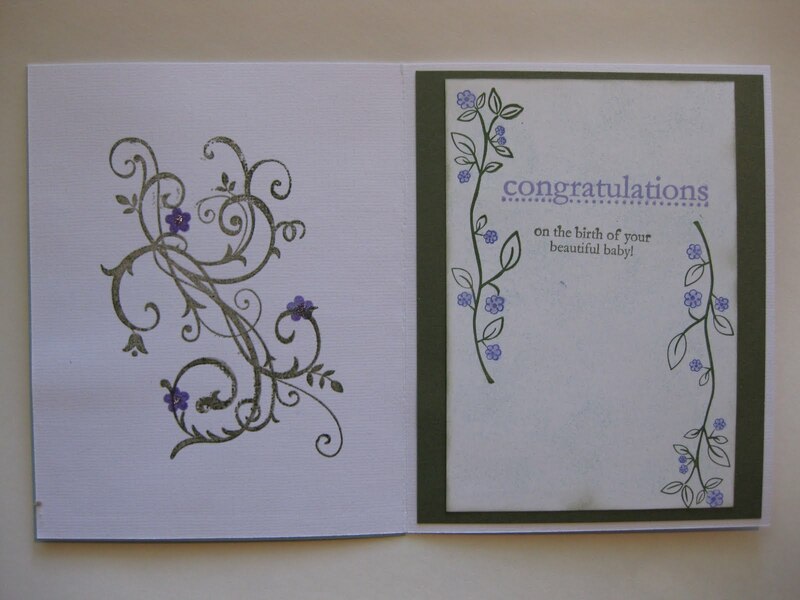 The flowers were first stamped with black ink and versamark and then heat embossed with clear embossing powder. I then punched a 1 1/4" circle out of a post it note to mask the paper so a sun is created. 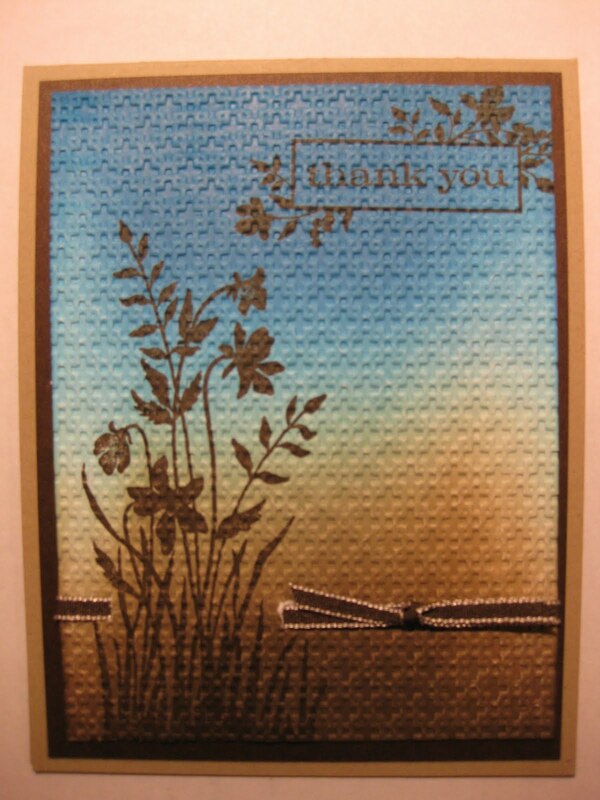 I first used daffodil delight and peach parfait with a brayer for the sky. I sponged cajun craze across the top and down the sides. The hills were created by tearing the sticky edge of a long post it note in the shape of the hills. I covered the sky with it, then brayered cajun craze across the bottom. I finished the bottom by sponging early espresso at the bottom edge. A white gel pen was used to bright up the centers of some of the flowers. Yes, white gel pen drys on the top of embossing - go figure. Markers do not do this, only gel pens. Cool! I used my stampamajig (love that thing) to align my sentiment into the sun after removing the post it note mask. 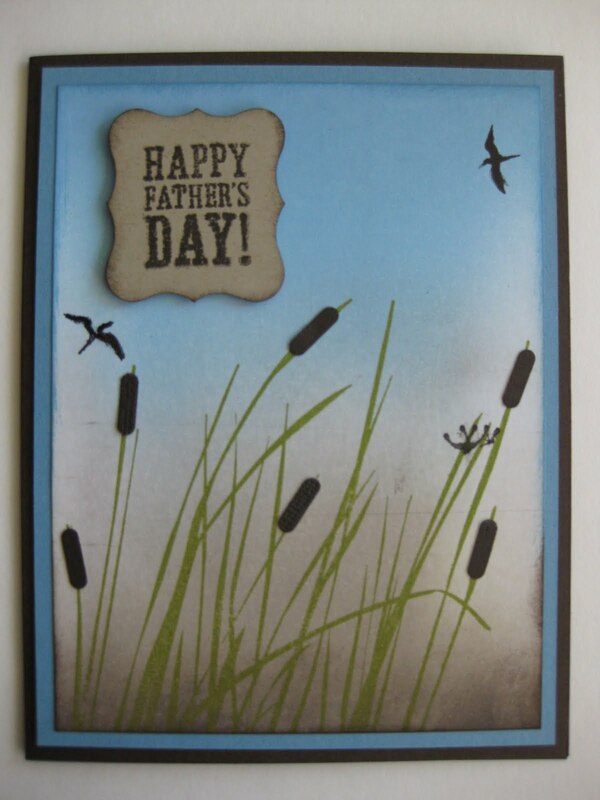 Brads were added and then it was mounted on to Cajun Craze cardstock. I made six of these in about an hour and a half. I know, right? It really goes pretty quick! 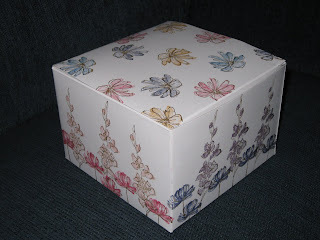 Hope you'll try that brayer and heat gun you have stashed in a back drawer and share what you create! Have a beautiful day! I had lots of fun making this! Colors used are Baja Breeze, Soft Suede, Crumb Cake and Very Vanilla, all from the Elegant Soiree DP. Soft Suede is the only ink used here, on the main image, flower and edges. 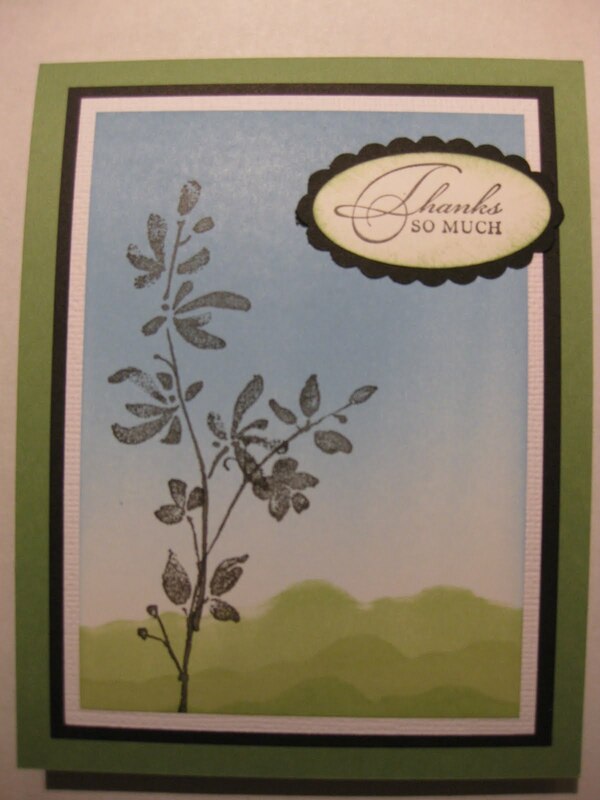 The pearls and ribbon are also new fom Stampin' Up! There is no sentiment, as I don't usually put sentiments on card exchanges so that people can use them for what fits their needs. I'm off to ride my bike - have a creative day! Elegant Soiree DP was used here, with Crumb Cake, Marina Mist and Soft Suede. Curly Label Punch, Scalloped Oval Punch Corner Rounder and Small Oval Punch were also used. I love the new Elegant Lines Embossing Folder too! It was used on the main image mats. Awash with Flowers Stamp set was used for the main image, and Elements of Style was used for the sentiment. I really like this card! Pear Pizzaz "paired" with Cherry Cobbler is a yummy treat! I love love love the tree image from the Snow Swirls set! It is embossed, with little touches of dazzling diamonds and a dash of bling to top the tree and the sentiment from Delightful Decoration. Early Espresso and Very Vanilla cardstock were also used, along with the scallop border punch, 1" punch, 3/4" punch and Vintage Wallpaper embossing folder. 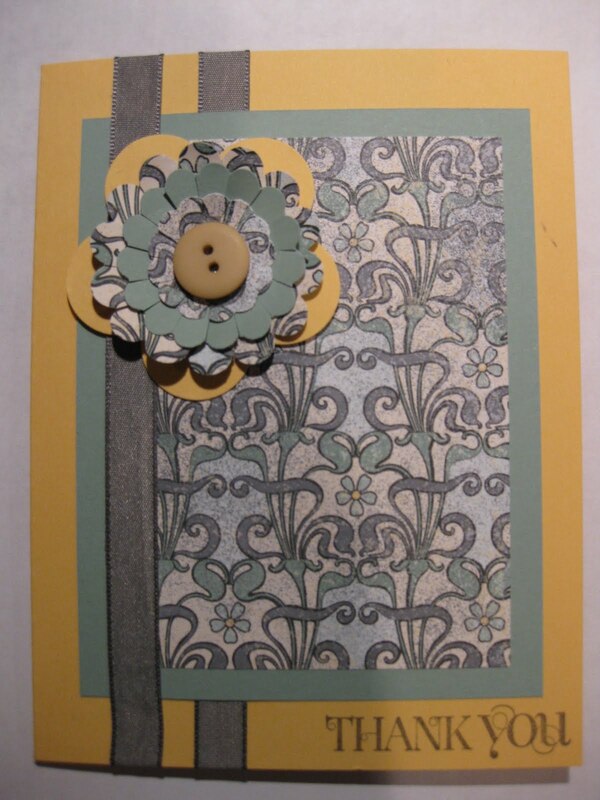 This one uses 3 stamp sets: Elements of Style, Vintage Vogue and Greenhouse Garden. 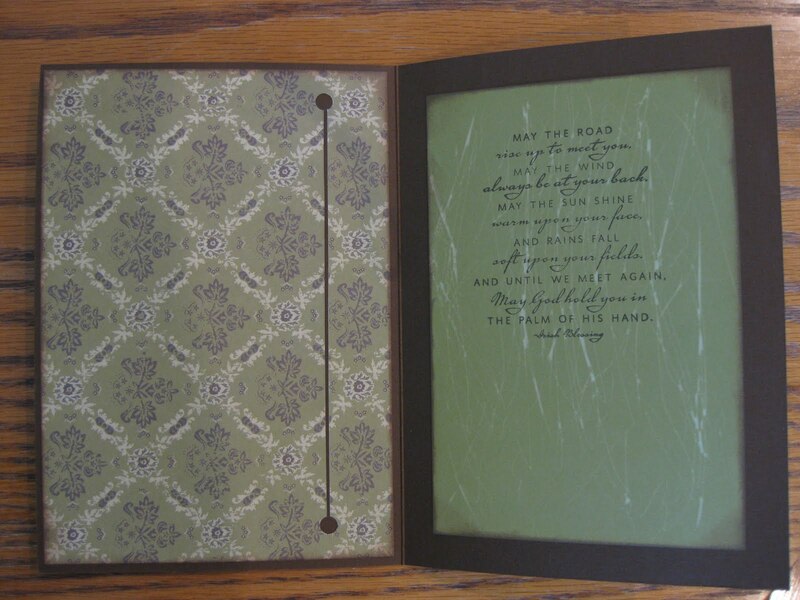 Crumb Cake, Very Vanilla, Marina Mist, Wild Wasabi and Soft Suede were all used as Ink for this project. The Very Vanilla is craft ink, which I used around the edge of project to soften the edges. I really like the little pearl flower center alot! I think this one might be my favorite! 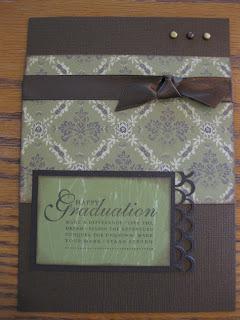 I used Wild Wasabi, Marina Mist (crazy about this color) and Very Vanilla as cardstock and Inc. I again, like to use the Craft Very Vanilla to sort of 'antique' the edges of these vintage style images. The flourish and flowers are both from Elements of Style. The flower image was stamped in black stazon, and then colored with blender pens. I finished off the panel edges with a light coating of blank ink and the ticket punch! I thought this could be used for almost any occasion! I have more cards and projects to post later this week, so post your thoughts here, share your casings and come back later in the week for more convention projects, cards for fundraisers and more new items from the Stampin' Up catalog! Make it a creative day! I embossed, punched, sponged and stamped to my heart's content! I put in to play the Orchid Opulence and Lovely Lilac with Old Olive and Always Artichoke for anything green. Blush Blossom was used for the baby face. Stamps used are the flourish from Baroque Motifs, outside sentiments are from Tiny Tags and the flowers were stamped with Itty Bitty Bits. The punch is from the Itty Bitty Bits punch set, along with the word window and medium oval punches. 3/4" and 1/2" punches were used for the peas and face, and the leaves were trimmed down from the two-step bird punch. The flourish was clear embossed and the butterflies are all from the butterfly embosslit. 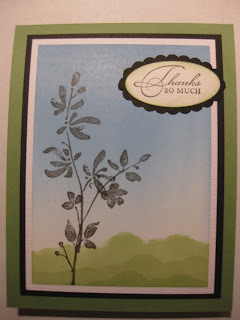 A white gel pen (Stampin' Up! really does sell the best one I've ever found) was used for all the highlights. So cute! Thanks for looking! The left side is stamped directly on to Marina Mist, using the same techniques as the front of the card, except for brayering the blue inks. I used Crumb Cake for a computer generated sentiment, compliments of a quote from Bill Cosby. Hope you can take this Father's Day card and turn it into something you can use for Birthdays, Sympathy, Get Well, or well, anything! From the new catalog.... so fun! Aren't new toys FUN!? 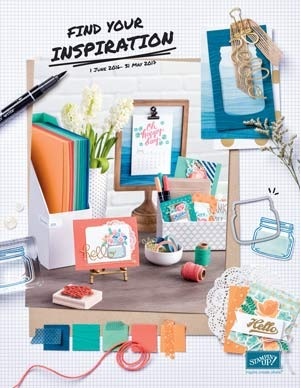 New colors, stamps, punches and always lots of fresh ideas await you in the new Stampin' Up! catalog! Remember that many of the new stamps and colors are available for My Digital Studio as well! Want more information on digital crafts? Email me! Below is a rather quick card I made for one of my clients. Hydrangeas grew in my backyard when I was a child and they bring back many fond memories of good times in that backyard! My mother showed me how to add colored water to the base of the bush to change the color of the hydrangea, so in her honor, I went with a red hydrangea, just like we used to 'make at home!' Details are below. Enjoy, create, and have a fabulous 4th of July weekend! Almost all NEW products were used for this card: My base card is Early Espresso cardstock, layered with Pear Pizzaz that has been dry embossed with the new Vintage Wallpaper folder. The Cherry Cobbler strip was border punched with the scallop punch. Early Espresso was used for the main image mat. Watercolor paper makes the main image mat because it works so well with the blender pens. 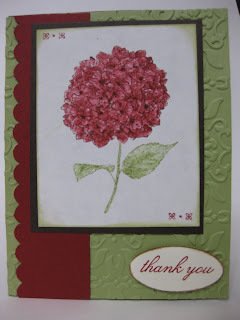 I used Cherry Cobbler to stamp the flower and was careful to load ink on only the flower portion of the stamp. The stem was colored with my Pear Pizzaz marker. I used a blender pen and just a little extra ink to color the image for more depth. Cajun Craze marker was used to color the centers of the flowers. I used my Cherry Cobbler marker to color only two images of the line design and stamp them in opposite corners. The sentiment and hydrangea are from the new "Because I Care" set. The sentiment was heat embossed with versamark and clear powder. The inside used Very Vanilla mats, and the same components as the outside of the card. I just might make a few more of these! Just wanted to shout out a big "Welcome" and "Thank you" to my followers! It's so fun to see your pics show up each morning, eagerly greeting me and inspiring me to make something for you to enjoy and re-create as your own! Thanks for stopping by and feel free to leave a comment or a message and let me know what you like best and if there is something you would like to see me create! Have a fantastic day!!! I really like the way it turned out! Here we go on the details: I used Daffodil delight as my base card, and the Garden Gala design paper for all printed paper. 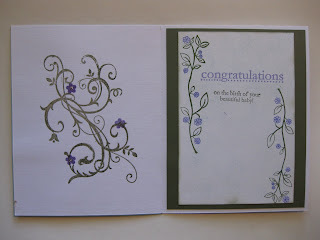 Cherry Cobbler, Marina Mist and Pear Pizazz were also used as card stock and ink. I realized later that actually, I think this paper may use Real Red and not Cherry Cobbler, but it still looks ok to me! 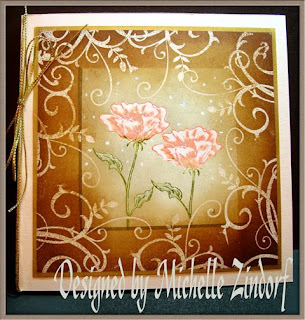 Four stamp sets were used: The new Friends Never Fade was used for the flower. I colored it with markers first, stamped it, then colored again with a versamark pen and heat embossed it. 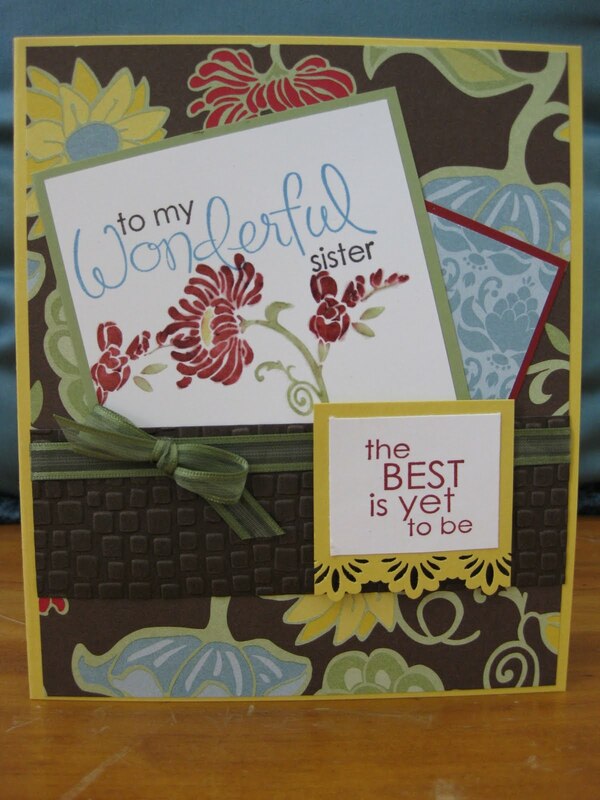 Wonderful Favorites was used for the outside greeting, and 'the best is yet to be' is from the Best Yet set. I didn't have any Pear Pizzaz ribbon - yet... but I will! I used some miscellaneous ribbon that came close enough until I get the real thing! 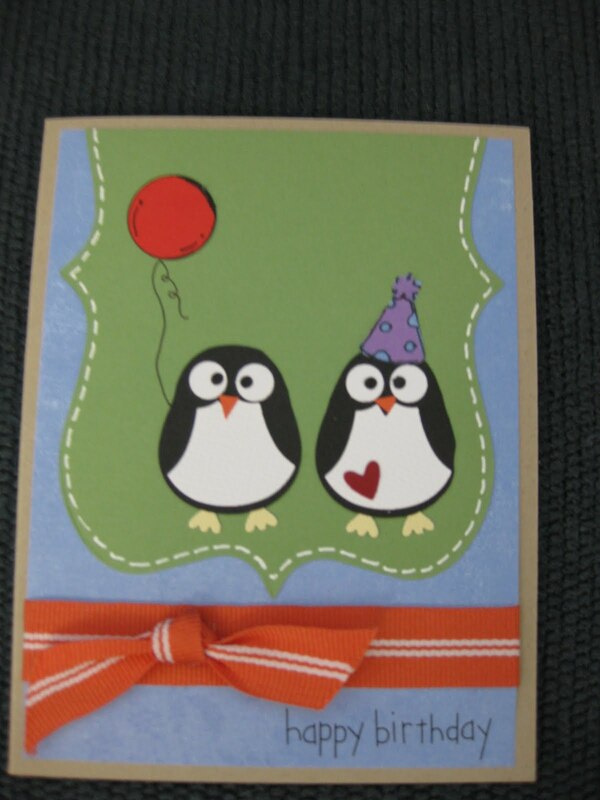 There really isn't alot of embellishments on this card - It's pretty simple with lots of layers and color. Funny, that's how I could describe my sister, colorful with lots of layers! June has grown wings and flown by! So much happening in my world this month - it's left me little time to create. 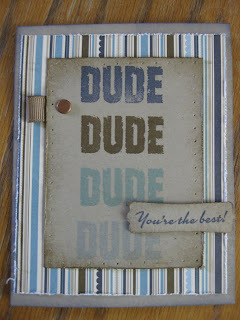 I did sneek some time in to purchase some new sizzix dies and wanted to share this creation with you. As some of you may know, I'm more of a 'case and renovate' girl, but I'm proud to say this one is an original and I'm pleased with the results. Hope you like it! I used Crumb Cake, Cherry Cobbler and Whisper White cardstock, Crumb Cake, Early Espresso, Craft White and Cherry Cobbler ink. Elements of Style, Vintage Vogue and Artist Etchings were my stamps of choice. I used a distressing tool for the edges of the cherry cobbler matt after running in through an embossing folder. I then crumpled the matt, smoothed it, and adhered it to the base card. The big note die was used on Crumb Cake CS, stamped along the edge with a Vintage Vogue stamp, then dusted the edges with Craft white topped off lightly with Early Espresso. I used another sizzix die to cut the WW and then edged it with Crumb Cake and Early Espresso before using versamark, clear embossing powder and Cherry Cobbler ink for the main image from Artist Etchings. It was then mounted with dimensionals. I stamped the round image and punched it out with the 1 3/4 punch, then used a stencil I had for the 2 inch circle matt. I distress the 2 inch circle a bit, too. The 'for you' image from Elements of Style was embossed on WW, then punched with the small oval punch and mounted with dimensionals. The brads are miscellaneous one I had that just so happened to match my ink - yay for miscellaneous brads! Can't wait to get the 'real deal' from the new catalog! The ribbon is white organza that was wrapped around the corner and adhered to the inside of the card. 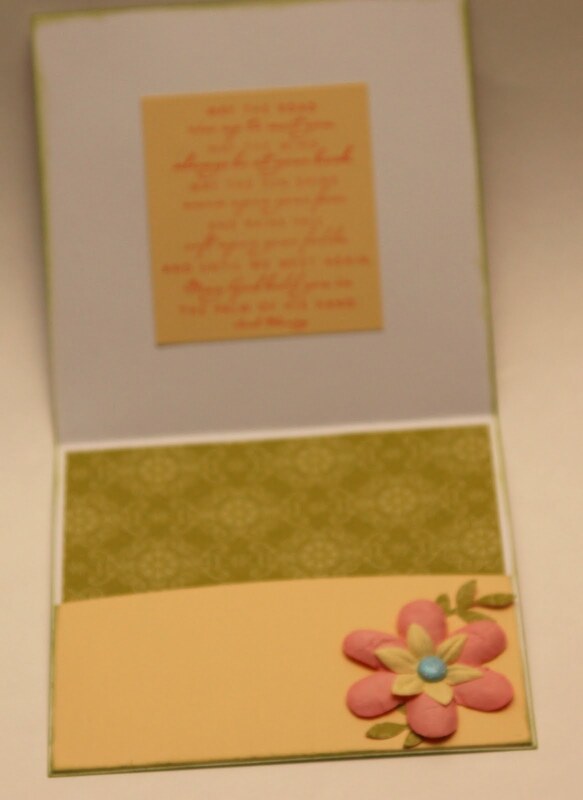 I created more dry-embossed panels for the inside of the card that covered the brad backs and the ends of the ribbon. Voila! I had a great time and can't wait to give this to someone for any occasion. Thanks so much for visiting my blog today. I hope it inspires you to create your own original or a case of this one! The flower image was stamped first by coloring the stamp with markers. I then colored them again with Versamark and embossed them. 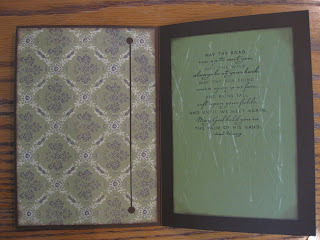 After that, I used only versamark to stamp the flourishes around the edge and then embossed those as well. I covered a 3" square in the middle, and then sponged Early Espresso along the edges, then wiped the ink of the flourishes. I removed the 3" mask and lightly sponged the center with Crumb Cake. I then took a ruler and the Early Espresso marker and defined the 3" square on the left and bottom edges to make the center pop a bit. I used a little trick for the ribbon: I tied my ribbon around a book first, then cut the ribbon in the back so I could position my bow/knot exactly where I wanted it, and then used snail adhesive to attach it to the back of the card front. I used the Modern punch and some misc. brads to accent the red in the flowers. I left some open space above the flowers so I can add a sentiment when I decide what occasion I will eventually choose for this card! This was a fun card to make! 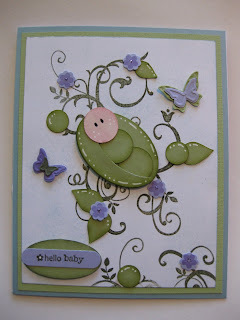 I'm looking forward to trying something similar with different stamps and colors. Enjoy! News Stamps for Preview of the New Catalog! New catalogs are always so much fun! The new Color Renovation at Stampin' Up has also been very exciting. I'm having a blast playing with new paper, stamps and markers. 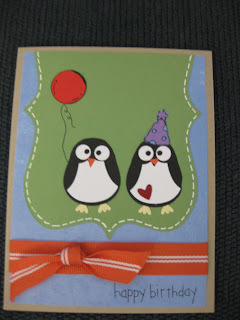 I used all of the new In Colors for this cute little card that could be used for a birthday, congratulations or encouragement. "Best Wishes"is such a versatile sentiment, don't you think? 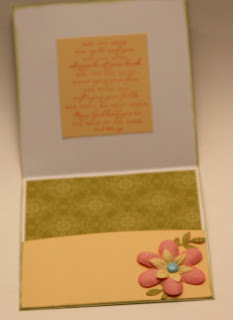 I used the slit punch, daisy flower punch, and the Itty Bitty Buttons that go perfectly with the Itty Bitty Bits stamp set. It's so nice to work with materials that coordinate so well together. 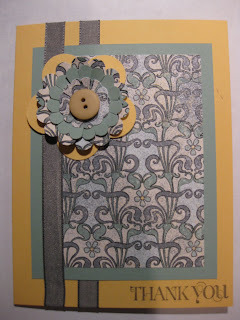 I'll be posting another creation made with some of the new colors from the color renovation, and another new stamp set! Off to the 'day job' for now. Happy Stamping and thanks for lookin'! I thoroughly enjoyed my Brayering Classes with Michelle Zindorf in Boise, Idaho a few weekends ago. We were asked to practice brayering. I kept my practice piece, and then came home and added some images from Awash with Flowers and a butterfly stamp I had laying around. I tossed in a miscellaneous button, ribbon and simple sentiment. I really enjoyed putting this together! The colors are some of my favorites: Bashful Flue, Old Olive, Pink Pirhouette. The design paper mat is from Bella Birds. 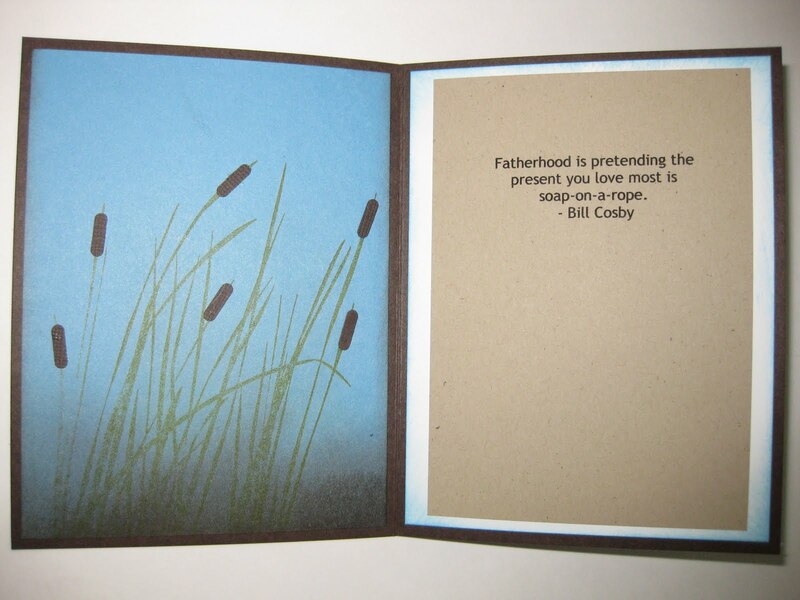 Hope this rather quick card inspires you to pull out your brayer today! My daughter has some of the sweetest friends! 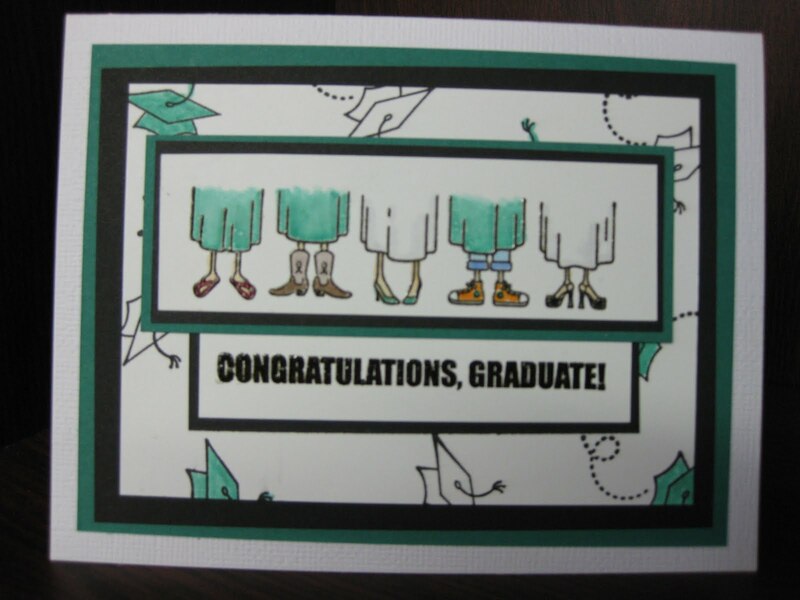 I chose a color that reminded me of each of them, and then put the combo together to create this graduation card. I used some diecuts for the vines behind the flowers. 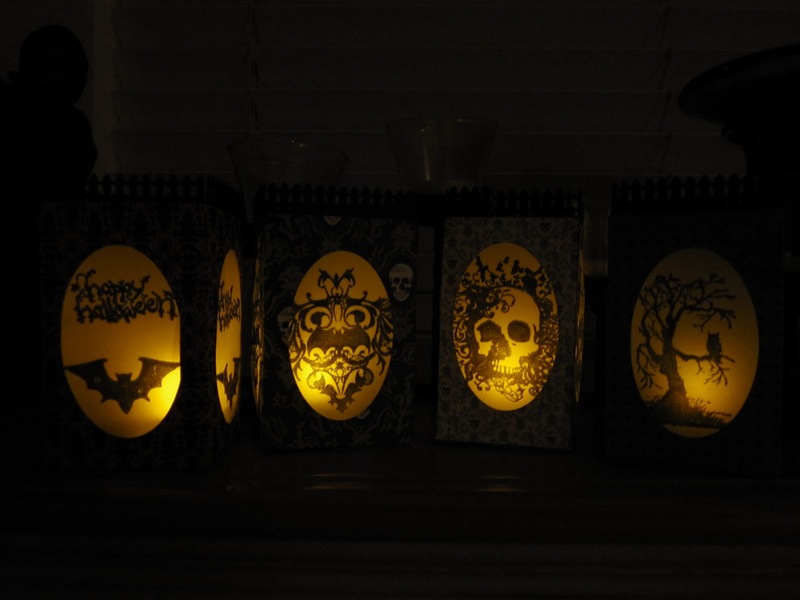 They were painted with pigment/Kraft ink, and then embossed. It was really fun! I had some flowers laying around that I've been wanting to use up and these were perfect. I could have also colored flowers from an SU! Pretties Kit and accomplished the same thing. The organza ribbon and pretties kit products can be dyed with ink or markers to match ANY project. Awesome! 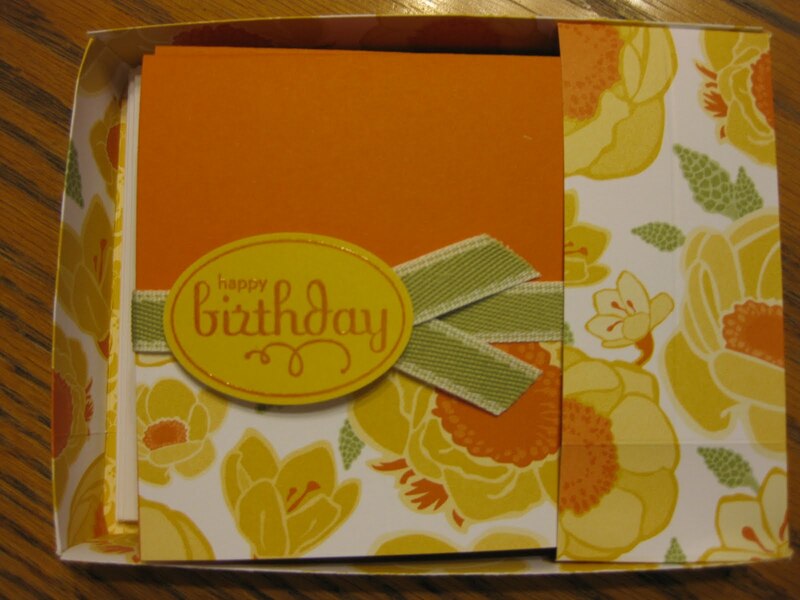 I made the inside of the card into a money or gift card holder. I cut the 'pocket' 1 inch wider than the card, and a 1/2 an inch taller than I wanted. I used a score-pal to create fold lines on the sides and bottom 1/2 an inch from the three edges. I cut the small squares off of the two corners, and then cute the flaps diagonally so when folded against the pocket they would lay flat. I adhered the background paper first, and the pocket on top after applying the flower with a centered brad. 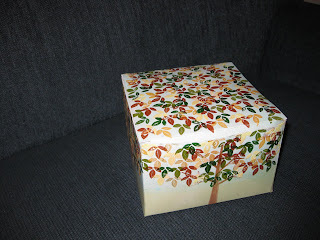 The leaves are from the new bird punch by Stampin' Up!. I punched two from the design paper, and then cut off about an inch of the stem before adhering them behind the flower. The sentiment above is an old irish blessing, fitting for a graduate just starting out in the world! I hope you can use some of these tips in your own creations. Feel free to contact me with any questions and make it a great day! Happy Stamping Everyone! I'll have a card using Stamping Pastels tomorrow! My friend invited me to participate in a card swap. 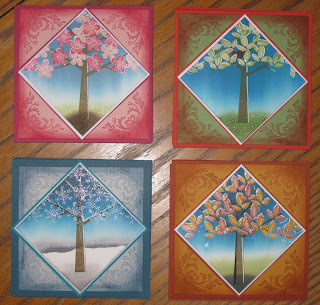 20 masculine cards, 20 feminine cards, and each participant gets one of each. Sounds easy and fun to me! These are my masculine cards. The top left corner is stamped in old olive and NOT heat embossed. The other three are heat embossed with versamark only. I played with the old olive design paper pack, and stamped across both vertical and horizontal lines, just to see what I liked better. I think I like the upper right better. Which do you prefer? The ribbon, I believe, is Garden Green or Mellow Moss. I wanted to go all monochrome, but couldn't find my Old Olive ribbon, lol! The Vintage Labels were also heat embossed with versamark and old olive, and then punched out with the large scallop punched and popped up with dimensionals. 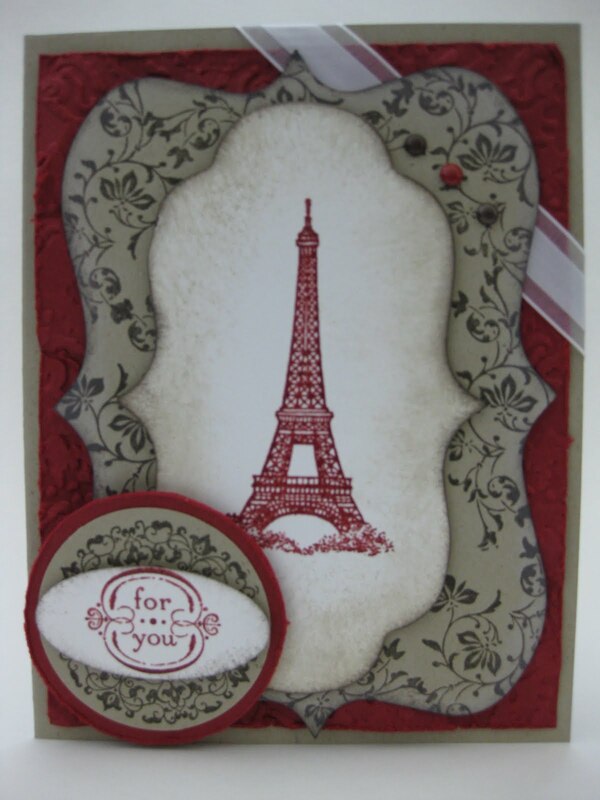 The card front was attached to textured whisper white cardstock, and sponged with Close to Cocoa around the edges. This is the last of my week of masculine cards! Coming up are some feminine graduation cards, simple 3 x 3 thank you notes inspired by Dawn Griffith, and the set of feminine cards for the above referenced card swap. I gotta say, I'm giddy! What fun - my first award! 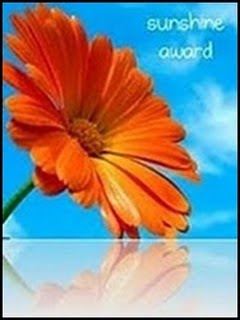 What an honor it is to receive this award from Chelsea Malouf (http://a-chelsea-morning.blogspot.com/). 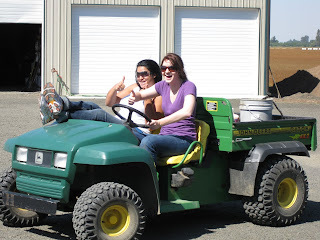 Chelsea has been my mentor and support in motivating me to get this blog up and running. Plus, I love literally everything she creates! Thank you so much for being an awesome friend, upline and mentor, Chelsea! Please go visit these blogs and leave a comment - it will be a li'l ray of sunshine and time well spent! I just got back from teaching a spin class and want to get today's card posted before I volunteer at Utah's Bikes for Kids cycling event. We give away 1,000 bikes to 1,000 underpriviliged children. It always proves to be a rewarding day! Did you know that money/bills are 6 1/8 inches long and 2 5/8" wide? Well, they are! For this 5 x 7 card, I used a pencil to mark 1/4" in from the top and bottom, and 1 1/2" from the left. That's where I punched each hole using a standard hole punch. Then I used my x-acto craft knife and cut a slit from hole to hole. I moved my metal rule over just a smidge (I know, so technical) and cut again, creating a thin 'slot.' I then used SU's snail adhesive for a full inch wide on the long edges and 1 adhesive length on the short edges. This creates a strong bond and a 6 1/2 " by 3" pocket for cash! Perfect! 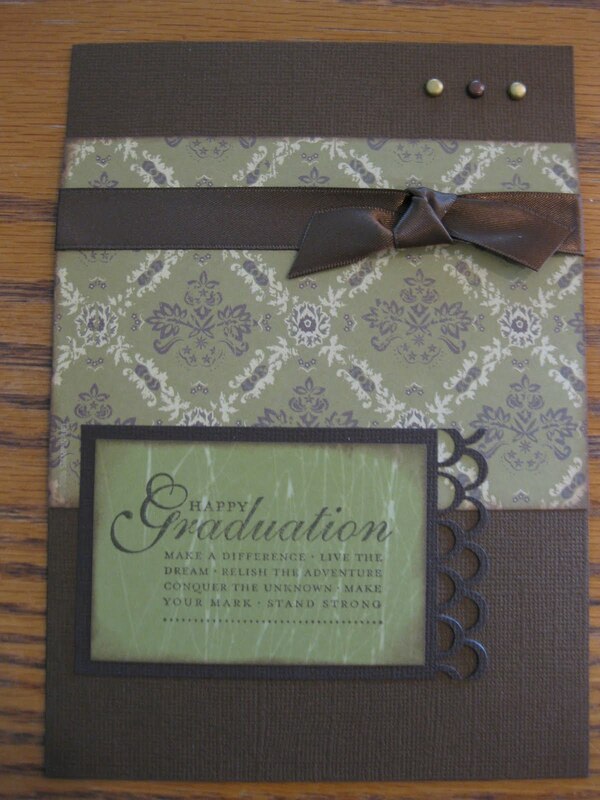 Other products used are: Baroque DP available at the Clearance Rack (see the banner above), Chocolate Chip card stock, Happy Grad stamp, Chocolate Chip 5/8" ribbon and classic ink, and misc. brads and edge punch. Any of SU's edge punches will work beautifully here! Thanks for checking out today's card! Tomorrow I'll post my masculine card from my upcoming card swap. Hope you've liked this week's Masculine Cards! 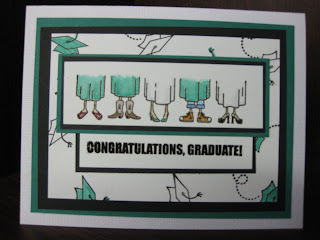 Here we go with more graduation cards for my daughter and her friends. This one, Go Graduate, from the summer mini catalog had everything I needed: An image, another image to create my background paper, and a sentiment. Perfect! This set can be purchased by clicking the image of the Summer Mini Catalog at the right. I used very basic suppies here.... just paper and stamping, plus a little embossing powder and versamark to make the main image and sentiment pop. Whisper White, Black and Glorious Green are the main colors, with Blush Blossom for skin coloration. Blender pens were used on the gowns. Colors from the Brights family were used for clothing colors. Best of luck to YOUR graduates, and happy creating!